Bankruptcy Information | Is The Credit Card Industry Redlining? Is The Credit Card Industry Redlining? Home > Life After Bankruptcy > Personal Finance > Is The Credit Card Industry Redlining? 31 Dec Is The Credit Card Industry Redlining? In a recent article found on theBankruptcy Law Network, “Credit Card Limit Cut Based On Where He Shopped”, Jonathan Ginsberg, an Atlanta Consumer Lawyerdiscusses the case of Kevin D. Johnson, a resident of Atlanta, Georgia. American Express cut Mr. Johnson’s credit limit citing “the poor repayment history” of other American Express customers who shopped at stores where Mr. Johnson shopped. The stores of ill repute? Well, American Express won’t say, but the charges that Mr. Johnson made were to Amazon.com, Ruby Tuesday, Wal-Mart, Starbucks and Federal Express. 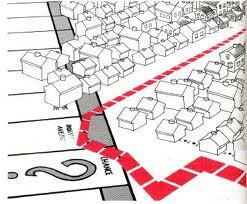 The term Redlining first came into common use in the United States during the 1960’s to describe a process where people living in predominantly minority neighborhoods were either denied home loans or home owner’s insurance, or were offered those loans and insurance at a higher cost because of where they lived. While the credit card industry denies that it is Redlining, data from a study of credit availability conducted by Ethan Cohen-Cole of the Federal Reserve Bank of Boston suggests otherwise. Cohen-Cole’s paper, “Credit Card Redlining“, compared consumers of comparable credit histories, with the only difference being whether they lived in a predominantly minority or predominantly white neighborhood. The study is important on the issue of Redlining because the actual race of the consumer was not at issue, only the racial makeup of the area where the consumer lived. The study found that “[a}ccess to consumer credit, both in volume and number, [was] negatively related to the racial composition of an individual’s neighborhood.” Stated another way, if you lived in a minority neighborhood, it was harder to get credit, and the credit extended was usually at a lower limit. With credit availability tightening it is more important than ever to make sure that all aspects of your credit (credit history, payment history, balances, etc.) are in order.